SPECIAL OFFER: For bookings of 3 days or more, one hour of internet will be given free of charge from the Wifi of the house. 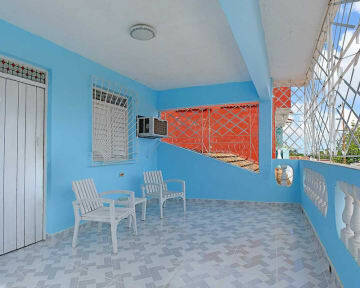 Hostal Haydee y Evelio is a comfortable and quiet house in the second level two rooms, located in a quiet area. Upon arrival, guests are greeted with a natural fruit cocktail or free drink. The family lives on the first level, is very friendly and always recommends the best places in the city and the area in general such as nightclubs, museums, beaches, river tours, etc. The services offered in the house at affordable prices so that you can enjoy a happy stay, such as a full breakfast, prepared dinner, bicycle rental, etc. We also have Wi-Fi service. In our accommodation, all people are welcome and we will be at your disposal in everything you need. 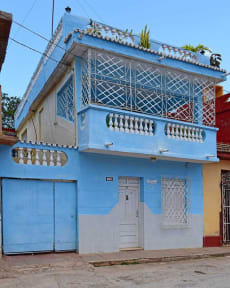 We are located in a quiet place, free of noise, suitable for rest, located in front of the Tobacco Factory, a few meters from the International Clinic and the traffic light that is at the stop for Ancón beach, only 4 blocks away Céspedes park, downtown, where you will find the Shopping Centers, Money Exchange, Banks, Travel Agencies, etc. We offer spacious and comfortable rooms, with air conditioning, wall-mounted fans, and windows to enjoy the natural light. They have comfortable beds with a total capacity for 5 people. Each one has a private indoor bathroom with hot and cold water 24 hours. There is a common area, for both rooms, where you will find a minibar, fresh water, beers and soft drinks. Check in and Check out: flexible - we still advice guests to contact the B&B to confirm arrival time.